Since its original publication in 1952, Fosdick's book has been the single most reliable treatment of one of the most important philanthropies in the United States and indeed the world. Fosdick served as president of the foundation for twelve years, from 1936 to 1948, when it was the largest grant-making endow-ment in the world. 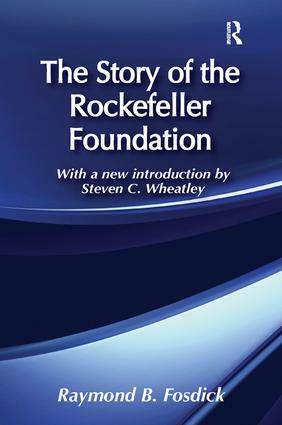 As Steven Wheatley notes in his valuable new introduction, in part The Story of the Rockefeller Foundation was intended as an instrument of institutional self-defense. When it was written, the foundation community was under mounting political attack from the right, and the book was meant to help balance the Scales by cataloging the foundation's good works. As a deliberate self-portrait, the book conceals as much as it reveals, while in the process it reveals a good deal about the author. Fosdick sees politics, like bureaucracy, as perhaps an avoidable problem and not an inevitable consequence of foundation activity. He sees foundations as engaging in the application of scientific, tech-nical, and organizational solutions to public problems through a ""venture cap-ital"" approach to discovering how to resolve them. Fosdick's ""higher ground"" approach became established philanthropic practice far beyond the Rockefeller Foundation. Consequently, this volume is significant as an institutional history as well as a charter for American foundations.